Welcome to the Top 32! It’s single elimination for here on out until we have a new champion! 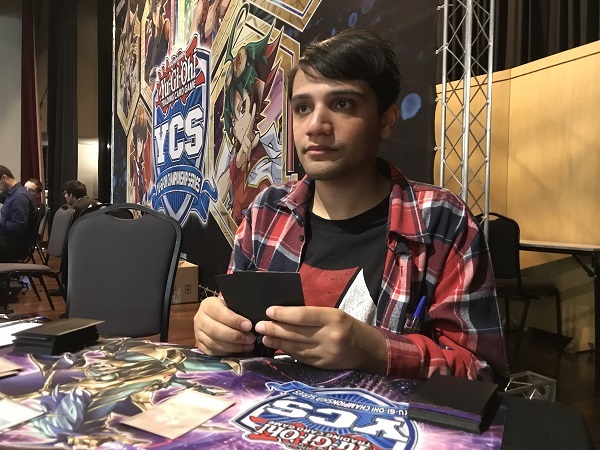 At Table 2 is the 6th seed Tiago Alves da Silva from Juiz De Fora, Minas Gerais, Brazil and his Sky Striker Deck taking on the 17th seed Ciao Santos Barreto from São Paulo and his Windwitch Trickstar Deck! We haven’t seen Windwitches in competition for some time, but their ability to deal effect damage and start combos with a single card (Windwitch – Ice Bell) complements the Trickstars ability to deal effect damage and start their own combos with a single card (Trickstar Light Stage or Trickstar Candina). One of these Duelists will move on to the Top 16 while the other will knocked out of the tournament. It’s time to Duel! Alves da Silva won the roll and elected to go first. he started with Upstart Goblin to draw a card, then activated Sky Striker Airspace – Area Zero and then Sky Striker Mobilize – Engage! to add Sky Striker Ace – Raye from his Deck to his hand. He the Normal Summoned Sky Striker Ace – Raye, activated the effect of Sky Striker Airspace – Area Zero targeting Sky Striker Ace – Raye then chained Raye’s effect to Special Summon Sky Striker Ace – Kagari from the Extra Deck. He resolved the Field Spell effect and added another Sky Striker Ace – Raye from his Deck to his hand. Sky Striker Ace – Kagari’s effect let Alves da Silva pick up the Sky Striker Mobilize – Engage! he just played and activated it again, this time adding Sky Striker Mecha – Widow Anchor from his Deck to his hand. He Set 2 cards to the back, sent Sky Striker Ace – Kagari to the Graveyard to Link Summon Sky Striker Ace – Shizuku and in the End Phase he used Shizuku’s effect to add Sky Striker Mecha – Widow Anchor from his Deck to his hand. Barreto drew Trickstar Reincarnation. He activated Trickstar Light Stage but Alves da Silva chained Twin Twisters, discarding Sky Striker Mecha – Widow Anchor to destroy the Field Spell and prevent the search, but Barreto had a Terraforming anyway to find another Trickstar Light Stage which was activated to let Barreto add Trickstar Candina from his Deck to his hand. Barreto then used Trickstar Light Stage’s effect to freeze the remaining Set Spell/Trap on Alves da Silvas field. Next, Trickstar Candina was Normal Summoned and its effect let Barreto add Trickstar Lycoris form his Deck to his hand. He Set Trickstar Reincarnation, Scapegoat and Called by the Grave. In the End Phase, Sky Striker Mecha – Widow Anchor was sent to the Graveyard without being activated. Alves da Silva activated Sky Striker Maneuver – Afterburners! which Barreto chained Scapegoat. Alves da Silva didn’t Chain any effects which let Barreto chain Trickstar Reincarnation. Another pass from Alves da Silva and Barreto chained the last Set, Called by the Grave, targeting the Sky Striker Ace – Kagari in Alves da Silva’s Graveyard. 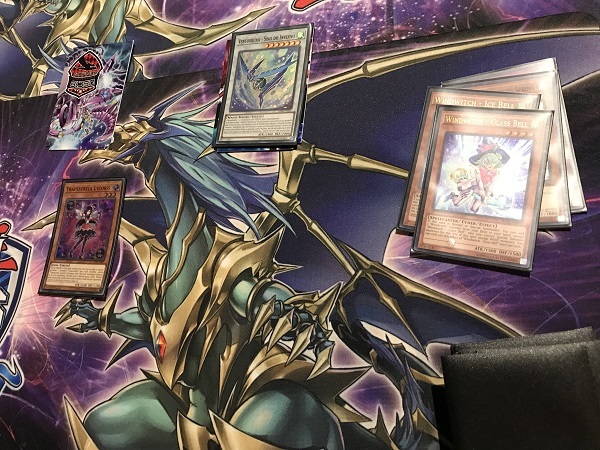 This prompted Alves da Silva to Chain Twin Twisters, discarding Sky Striker Ace – Raye (protecting it from Trickstar Reincarnation) and destroying Barreto’s Trickstar Light Stage. The chain resolved and Alves da Silva banished Shared Ride from his hand and drew a card. Alves da Silva’s Sky Striker Ace – Shizuku was swapped for Sky Striker Ace – Hayate which attacked a Token, destroying it. Alves da Silva used Hayate’s effect to send Sky Striker Mecharmory – Hercules Base from his Deck to the Graveyard. In Main Phase 2, Hayate swapped out for another Sky Striker Ace – Shizuku. In the End Phase, Alves da Silva added Sky Striker Mecha Modules – Multirole from his Deck to his hand with Shizuku’s effect. Barreto drew Trickstar Lycoris. he used a Token to Link Summon Link Spider. Then another Token was used to Link Summon Linkuriboh. 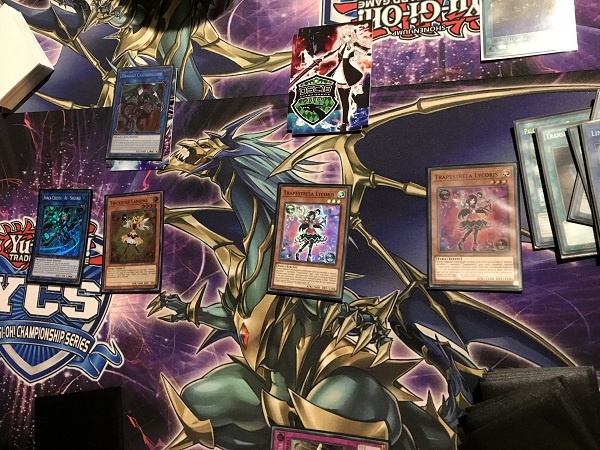 The remaining token and Linkuriboh were used to Link Summon Knightmare Cerberus. He then Normal Summoned Trickstar Candina and used its effect to add Trickstar Lilybell. He activated Trickstar Lilybell’s effect and Alves da Silva chained Droll & Lock Bird to prevent further searching or drawing this turn. Trickstar Candina, Link Spider and Linkuriboh were used to Link Summon Borreload Dragon. In the Battle Phase, Borreload attacked and took control of Alves da Silva’s Sky Striker Ace – Shizuku. Lilybell attacked directly and its effect picked Trickstar Lycoris back up which let Barreto used the 2 copies in his hand to Special Summon it and return the Lilybell in his hand. Still in the Battle Phase, Barreto used the Trickstar Reincarnation in his Graveyard to Special Summon Trickstar Candina and attack for another 1800, leaving Alves da Silva at just 100 LP. And with 2 Lycoris on the field, Alves da Silva’s next draw would end it. Barreto was one win away from securing a spot in the Top 16. Alves da Silva elected for Barreto to go first. He started with a Normal Summoned Windwitch – Glass Bell! Its effect left Barreto add Windwitch – Ice Bell from his Deck to his hand, but Alves da Silva activated Droll & Lock Bird to stop further searching this turn. Barreto Set Heavy Storm Duster and passed. Alves da Silva activated Sky Striker Mecha Modules – Multirole and Sky Striker Airspace – Area Zero. He Set a card and activated Area Zero’s effect targeting the Set but Barreto chained Heavy Storm Duster to destroy Sky Striker Mecha Modules – Multirole and the Set Terraforming. Alves da Silva resolved Area Zero’s effect and added Sky Striker Mecha – Eagle Booster to his hand. He then activated Twin Twisters, discarding Sky Striker Mecharmory – Hercules Base to destroy his own Field Spell. He activated Area Zero’s effect in the Graveyard but Barreto chained Ash Blossom & Joyous Spring to negate the effect and keep Sky Striker Ace – Raye in the Deck. Barreto He Normal Summoned Windwitch – Ice Bell, burning Alves da Silva for 500. Both Windwitches attacked directly, leaving Alves da Silva at 5000 LP. In Main Phase 2, he used both monsters to Synchro Summon Windwitch – Winter Bell! Its effect burned Alves da Silva for 800, leaving him at 4200. Alves da Silva Set a Spell/Trap and passed. Barreto activated Winter Bell’s effect for additional effect damage, then Normal Summoned Trickstar Lycoris. That was enough for Alves da Silva. he extended the handshake. 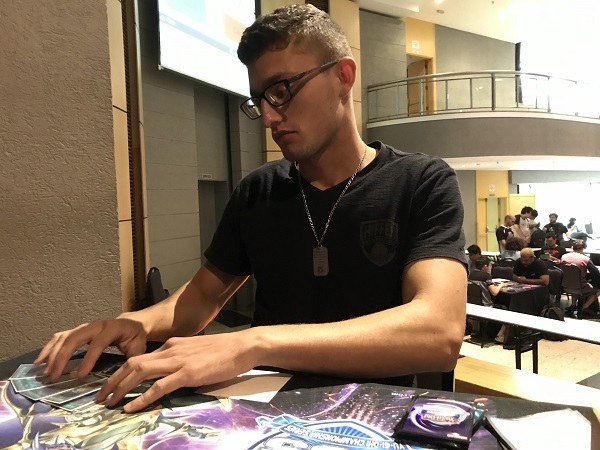 Barreto moves onto the Top 16 with Windwitch Trickstars!